The Soiled underwear belonging to Sheila - catalyst for foul play! Re: The Soiled underwear belonging to Sheila - catalyst for foul play! Menstrual blood often contains flakes of clotted blood. I think its a very strong possibility that this is the type of blood flake that what was tested in the lab and this is what sealed JBs fate. Here https://www.plim.fr/en/content/19-about-menstrual-blood - educate yourself! Menstral blood is different from arterial blood! So she took the bucket home then? Yes I am aware of that. A while ago I looked into how to determine one from the other via forensic testing. Nothing the lab done back in 1985 would have given them such information. KM testing and ABO testing cannot distinguise one from the other. Mike, when AE took the witness stand, she claims to have put the clothing back in the soak and left them at WHF. This contradicts he COLP statement where by she took them home. My understanding is that Ann Eaton took the knickers away from the scene in the boot of her car - I'm sure Jeremy told me that she took them away in the bucket in the boot of her car. I was interested in this when Jeremy first spoke to me about it because of the risk of contamination considering that Jeremy told me that she took the silencer away on that occasion in the same bucket. But in any event, if the relatives didn't find a silencer at the scene on 10th August 1985, does it mean that Ann Eaton recovered the bloodstained knickers and took them away on any other day? For example, sometime in September 1985? I think it highly unlikely that Sheila's knickers would have remained in the bucket of water at whf until September 1985.. Considering the discrepancies in her statements its difficult to know what exactly happened. In the 1986 trial she gives the impression the stuff in the soak was left at WHF. She does not actually mention the underwear at trial (unless its in that section cut out). In 1991 she claims to have thrown the underwear into a bin. Then latter in her statements describes taking the contents of the bin home with her. Did she realise what her latter statement meant? Considering that the blood and paint was confirmed at the lab on the 13th of August. It narrows down the suspects. Allthough Stan Jones and Ron Cook handled the silencer prior to the 13th they have no motive or any realistic means. And only handled it because the relavtives brought it to their attention and were doing their jobs. There no evidence to show that PE,DB or RWB knew of the knickers being taken back to oak farm or where to find the scratch marks. How ever AE does and considering the discrepancies in her statements and trial testimony, this is why she is my prime suspect. Do I think AE had PE, DB or RWB in on it also? Thats very possible but i struggle to imagine them all agreeing and conspiring to do something so disgustingly evil. This to me is a one person crime. Considering the discrepancies in her statements its difficult to know what exactly happened. I agree, because her evidence is all over the place.. In the 1986 trial she gives the impression the stuff in the soak was left at WHF. She does not actually mention the underwear at trial (unless its in that section cut out). I have not yet seen any mention during her trial transcript to Sheila's knickers, but she does mention then in some versions of her statements! In 1991 she claims to have thrown the underwear into a bin. what was she referring to?Then latter in her statements describes taking the contents of the bin home with her. I always assumed this was reference to the bucket!Did she realise what her latter statement meant? there were two buckets with soak in them as I understood it..
Allthough Stan Jones and Ron Cook handled the silencer prior to the 13th they have no motive or any realistic means. I don't think DS Jones and DI Cook had any involvement with the silencer the relatives took possession of in September 1985. It was HQ SOCO who had dealings with the second silencer (DC Oakley, DS Eastwood and DS Davison), and Witham SOCO (Cook, Davidson, Hammerless and Bird) who had dealings with the first one!And only handled it because the relavtives brought it to their attention and were doing their jobs. But what if the only silencer found by relatives was inSeptember 1985, and the Witham SOCO had nothing whatsoever to do with it? There no evidence to show that PE,DB or RWB knew of the knickers being taken back to oak farm or where to find the scratch marks. Actually, I think there is mention in one version of a witness statement or some note or other where David About flour makes the connection between paint on the silencer and the red oak Ted kitchen aga surround..How ever AE does and considering the discrepancies in her statements and trial testimony, this is why she is my prime suspect. Brother and sister could have been in on it together.. The red paint did exist on the silencer on the 13th of August. Its the KM negative "red stain" on the knurled end of the silencer. Lab' document you posted up dated 13th August 1985 is a fake - the silencer taken to the lab on 13th of August had an exhibit reference of SJ/1 Lab' item no.22, neither SBJ/1 nor DB/1 had a lab' item no. Reference of 22, SBJ/1 in that configuration was never sent to the lab', and when DB/1 got sent to the lab' on 30th August 1985, it had a lab' item no.23.. The reference to the silencer as exhibit DB/1, lab' item No.22, dated 13th August 1985 is therefore clearly a forgery, that was introduced as a result of the attempt to merge two silencers into the same one..
Also, I believe the red stain to which you are alluding to , to be a stain nestling in and around the aperture on silencers (SJ/1,22) end cap, which later on, After 13th August 1985, Glynis Howard tested Positive as human blood! Its a document made up of Glyniss Howards handwriting. Not fake at all. "red stain on gridded pattern - KM negative"
Why are AE's discrepancies important but Jeremy's not? Yes, it is fake, because it refers to a different silencer than she was presented with, and she didn't have possession of the silencer long enough to give such a detailed analysis - she took a swab from the aperture that's all she did on the 13th August 1985, she couldn't have thought that the silencer she examined on that day, was referred to previously by the different exhibit reference of SBJ/1, because the silencer bearing that configuration was never taken to the Lab', nor could she have known on 13th August 1985, that the next time the silencer would arrive at the Lab' let's say on 30th August 1985 that it would be referred to as exhibit DB/1 (23), and that by November 1985, somebody would be requesting the ballistic expert, to alter lab' item no.23, into no.22..
Information which Glynis Howard could not possibly have known about on 13th August 1985, was added Much later on with deception in mind.. 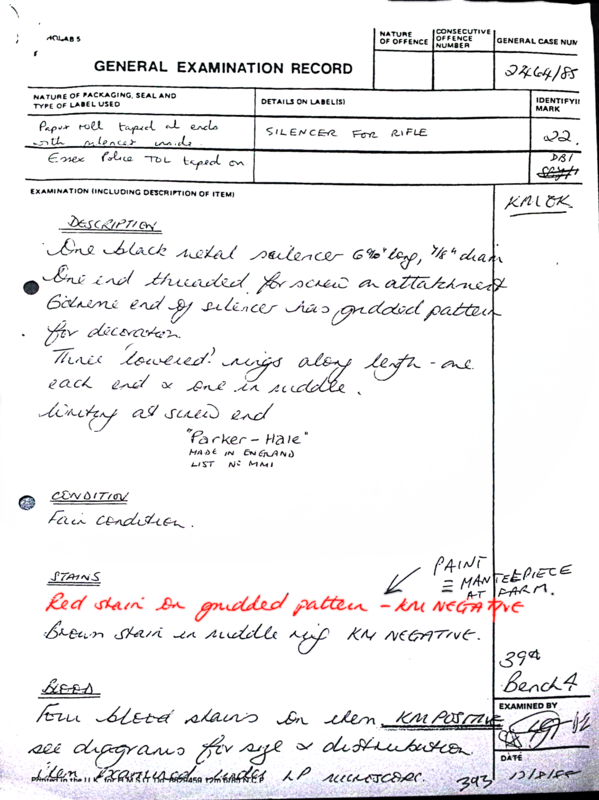 I note that you deliberately did not post the first page of that document, also dated 13th August 1985, where it clearly states on the diagram that red paint particles noticed in knurled pattern of the silencers end cap after the silencer had been returned to the Lab' for fingerprinting of it by the police! This gives a clear indication that the red paint was only noticed on the silencer after it returned to the lab' on a second occasion! I don't believe that it was sent back to the lab' in the ' guise of exhibit DB/1, 23, (or 22) on 30th August 1985, I think the item sent to the lab' on that occasion was the source for the blood group results obtained afterwards, but certainly not prior to 20th September 1985 when a silencer arrived at the Lab' for the second time! In view of there existing no fingerprint evidence pertaining to any silencer as alluded to by DI Cook on either 15th and 23rd August 1985 at the Sandridge police research and development centre, as confirmed by the COLP investigation, the only reliable information that a silencer did get fingerprinted, was that it got fingerprinted by DS Eastwood and DS Davison (HQ SOCO) on 13th September 1985. This being the now indisputable case, the silencer with the red pain particles upon it could only have been received at the Lab on some occasion after Eastwood and Davison had fingerprinted 'it'.. This fits in snugly with the now known fact that the silencer did not get sent to the lab' until 20th September 1985, which was the second time a silencer had been sent / taken to the Lab'. Indeed, when this silencer was eventually examined (26th September 1985), this was the occasion when the paint from the kitchen aga was first noted! Moreover, this wasn't the original silencer which Cook had taken to the Lab' on 13th August 1985, this was a different silencer (DRB/1) found at the scene in September 1985 by the relatives.. So, the document you have sought to rely upon by claiming that there was red paint noted on the first silencer on 13th August 1985, was created much later on by adding information onto it, which could not possibly have been noted until over a month later on a different silencer altogether.. The Blood group evidence could not have been found inside the silencer (DRB/1) exhibited during the trial (court exhibit no.9), because it did not arrive at the lab' until 20th September 1985, making it impossible for this part of the prosecutions case to be true! The best way to proceed from here on in is to pay attention to what I am due to be saying here very shortly, and if at all possible try to let some of what I am about to say sink in, because it's the truth! In fact, I shall start a new thread and try to keep everything simple!